Claire is from Yorkshire, England and is a graduate of the Royal College of Music, London. After studying at music college, Claire worked in various music schools including Bermuda School of Music, Hamilton Bermuda. Now permanently residing in Calgary, Claire is music director and vocal coach of Silver Stars Musical Revue Society. She is also accompanist at Calgary Girls Choir and performs regularly in recitals. 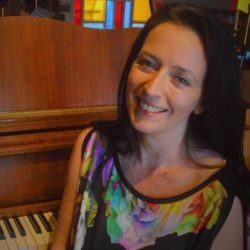 Taking music in the community is important to Claire and she enjoys outreach with her various groups which include The Jabberwocky Players – a music ensemble that presents to children. Claire’s musical interests extend beyond her classical training and she enjoys performing jazz with Clicquot Trio.